Marcus Clarke is primarily known as a Puppeteer for Film and Television, from Little Shop of Horrors, Dappledown Farm and Bookaboo to Hans Solo a Star Wars Story. He also creates Puppet characters thru HandsUpPuppets. Marcus though began as a Fine Artist and creates and exhibits his artworks to this day. They are mostly Composites, Collages and Assemblages. His Artworks or Objet D'art draw on older art forms like Medieval Reliquary, Well Dressing, Religious Iconography and other sacred art but also on Mankind’s need to share things, Keepsakes, Mementos, Souvenirs, Heirlooms, Memorials and Memories. Each work is built or made up around one central character or characterization, something, with ideas and objectives radiating out of it in various degrees and volumes, creating an emotive visual experience. Marcus creates his works using a process he calls New Art Enshrinement which like most of his work is rooted in the ancient art and craft of Puppet Making and in part shares its objective to create the illusion of life. Indeed materials used to create them still include Puppet Making materials, glass eyeballs and faux fur. Early works show a clear Puppet Making craft root. Added to them now though are Antique Jewellery, Gems, Gold Leaf, Paint and Found Objects all mounted on board and then Vacuum Sealed together in a preserving plastic bag that acts as both glass and frame. This is his very latest Toolbox or Arts Practice addition and completes his journey from Puppet Maker, Character Creator to Reliquary Maker and Contemporary Visual Artist. 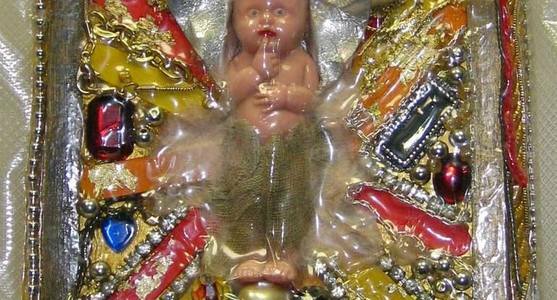 His latest works also share with Reliquary and Icons the idea of making belief Incarnate. Like a Lucky Horseshoe, The Ark of the Covernant. Like ancient artefacts th ey hint at the vestiges, remains or shadow, the hidden glimmer of a modern day world filled with belief and worship, a Spiritual Madness that can be accessed through them. One that places no value on fame. He believes he is creating one sort of Treasure from another and immortalizing it, freezing it in time to share with others. Lots of ideas in there. Mansfield College of Art. Warwick Uni. 2015 The DogHorseCoat Art Exhibition one man show. First Floor Gallery Central Library, Nottingham. 2015 Surface Gallery International Postcard Show. Two works. Naval rule and Poster. 2011 Nottingham Castle Gallery Annual Open 2011 1x Intervention and 1x exhibited work plus Video Film made. 1977 Mansfield College of Art, now Vision West Notts College. Various.